CBS’ Super Bowl XLVII broadcast reached an average of 108.41 million viewers in the United States, while a record 164.1 million people in the U.S. watched all or part of the telecast for at least six minutes. Beyoncé starred in the Halftime Show, which included a reunion performance with Beyoncé and her former Destiny’s Child bandmates, Kelly Rowland and Michelle Williams. The Post-Game Show included the Lombardi Trophy presentation, awarded to this year’s NFL champion Baltimore Ravens. 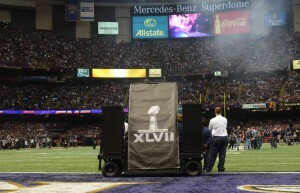 For Super Bowl XLVII, ATK Audiotek deployed 16 of its custom-designed cart systems, which allow for easy setup between events, and quick transport of the JBL VERTEC loudspeakers on and off the field. Eight of the carts included five VERTEC VT4889 fullsize line array elements, while the other eight carts included four VT4889’s. Each cart was also equipped with two VT4880A fullsize arrayable subwoofers, while the four carts that split the 50-yard line for field foldback also each held two VRX932 Constant Curvature loudspeakers.